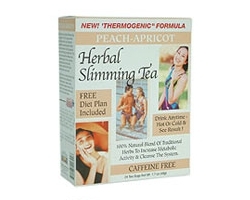 21st Century's Herbal Slimming Tea is a blend of 100% natural herbs which provides a light, delicious caffeine-free beverage that helps achieve results in aiding digestion and contributing to weight loss. This all natural herbal tea offers a rich, satisfying taste in hot or iced tea and provides slimming and digestive benefits that may be enjoyed after every meal. 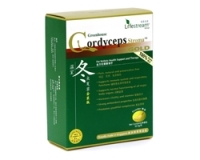 21st Century's Herbal Slimming Tea combines herbs to promote a 'thermogenic' reaction which increases metabolic activity. The result is that excess calories and toxins will be eliminated. Steep 1 tea bag in a cup of boiling water for 2-5 minutes to desired strength and taste. Drink 15 minutes before or during meals. If desired, add sugar or sweetener to taste. Begin drinking at half strength by diluting with water and reducing the steeping time. Gradually increase the tea strength as your digestive system adjusts. This product contains Senna leaves. Read and follow directions carefully. Do not use if you have develop diarrhea, loose stools or abdominal pain. Consult your physician if you have frequent diarrhea. If you are pregnant, nursing, taking medicine or have a medical condition, consult your physician before using this product. Made from Senna leaves, Malva leaves, Licorice Root, Panax Ginseng Root and Natural peach and apricot flavours. No sugar, salt, yeast, preservatives or artificial flavours/colours. Not a significant source of Saturated fats, Cholesterol, Dietary Fibre, Sugars, Vitamin A, Vitamin C, Calcium and Iron percent daily value.